Dubai, UAE, September 25, 2018: In celebration of the National Day of the 88th anniversary of the Kingdom, Al-Jazeera Paints Company held a special celebration for the children of Al-Joof region, where it launched a national celebration for children last Thursday and Friday in Al-Joof Plaza complex in Sakaka city, and provided them with paints and colors to express their happiness of the Saudi National Day through their various drawings on wooden tables, paper plates and more and equipped tables for children to sit and celebrate this beautiful day to exercise various activities and distributed flags and delightful prizes by the end of the day. The company will set up a similar event in Arar city in the Northern Borders area in Arar Mall next Thursday and Friday to spread more joy and happiness on the day of the great homeland. 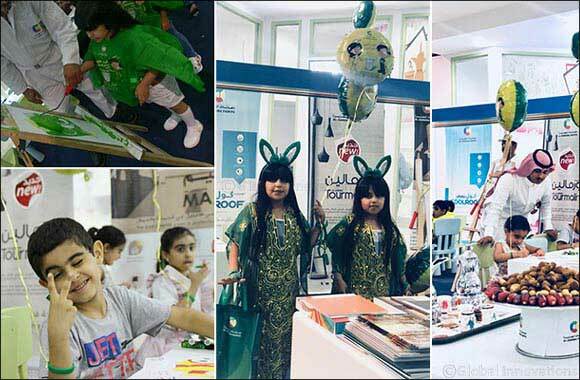 More than 300 children are expected to attend these events where it hopes the public will admire and satisfy them and shower the children with an atmosphere of joy and happiness. Among its activities, Al -Jazeera Paints has produced a short artistic work that indicates to which extent the Saudi traditional arts are linked to the civilization of the homeland and its development via the ages, presented in the social media and received wide appreciation reached about 900,000 views. It is noteworthy that 'Al- Jazeera Paints' is one of the oldest national companies in the Kingdom of Saudi Arabia, as it originated in the country and supported it for nearly 40 years and has played a major role in enriching its economy and serving its youth, so it associated with it in a deep-seated connection with a great deal of pride and belonging.